Falling into Midnight is finally here! The long wait is over! I’m happy to finally announce the official release of my debut novel FALLING INTO MIDNIGHT on 9/15/2018! Fresh on the heels of a job gone bad, Ori jumps at the chance to finally give up a life of crime for her dream job. 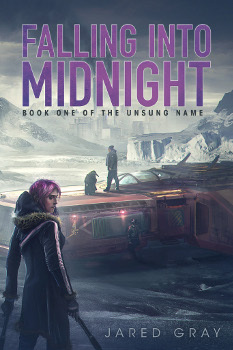 But when her crew’s first expedition leads them to a backwater ice mine that’s hiding an ancient, dangerous secret, Ori and her crew may get more use out of her old skills than her new ones. Come join Ori and the crew of the More Gravitas on the first leg of their epic adventure! Preorders are available online now, I’m selling signed copies through my website, and we’ll be throwing a launch party at Gangplank in Chandler, AZ on release day. Signed paperbacks will be available, but no purchase is required to come join in the celebration.